Indoor cats are usually provided with a litter box containing litter, typically bentonite, but sometimes other absorbent material such as shredded paper or wood chips, or sometimes sand or similar material. This arrangement serves the same purpose as a toilet for humans. It should be cleaned daily and changed often, depending on the number of cats in a household and the type of litter; if it is not kept clean, a cat may be fastidious enough to find other locations in the house for urination or defecation. This may also happen for other reasons; for instance, if a cat becomes constipated and defecation is uncomfortable, it may associate the discomfort with the litter box and avoid it in favor of another location. A litterbox is recommended for indoor-outdoor cats as well. Daily attention to the litter box also serves as a monitor of the cat's health. Numerous variations on litter and litter box design exist, including some which automatically sift the litter after each use. Bentonite or clumping litter is a variation which absorbs urine into clumps which can be sifted out along with feces, and thus stays cleaner longer with regular sifting, but has sometimes been reported to cause health problems in some cats. Toilet-trained house cat. Litterboxes may pose a risk of toxoplasmosis transmission to susceptible pregnant women and immuno-compromised individuals. Most indoor-only cats would not normally be exposed to the disease and are not usually carriers. Transmission risk may be reduced by daily litterbox cleaning by someone other than the susceptible individual. Some cats can be toilet trained, eliminating the litterbox and its attendant expense, unpleasant odour, and the need to use landfill space for disposal. Training may involve two or three weeks of incremental moves, such as moving and elevating the litterbox until it is near the toilet. For a short time, an adapter, such as a bowl or small box, may be used to suspend the litter above the toilet bowl but under the toilet seat. 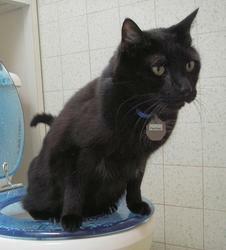 Several kits and other aids are marketed to help toilet-train cats. When training is complete, the cat uses the toilet by perching over the bowl. However, as the Toxoplasma gondii parasite often found in cat droppings poses a threat to endangered sea life and cat owners in coastal areas are encouraged to dispose of droppings in the trash rather than flushing them.